I have been as far East as Taquitos Jalisco in Mesa, and as far North as El Nopalito in North Phoenix, but now I figure I should head South and tap into the uncharted territory that is the city of Chandler. 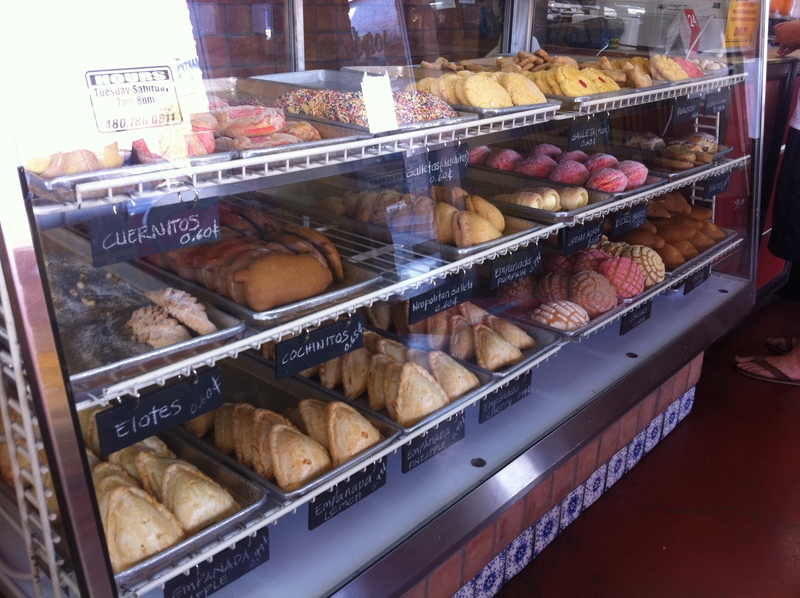 On the corner of Arizona Avenue and Hamilton lies this little gem called El Sol which doubles as both a restaurant and a bakery. 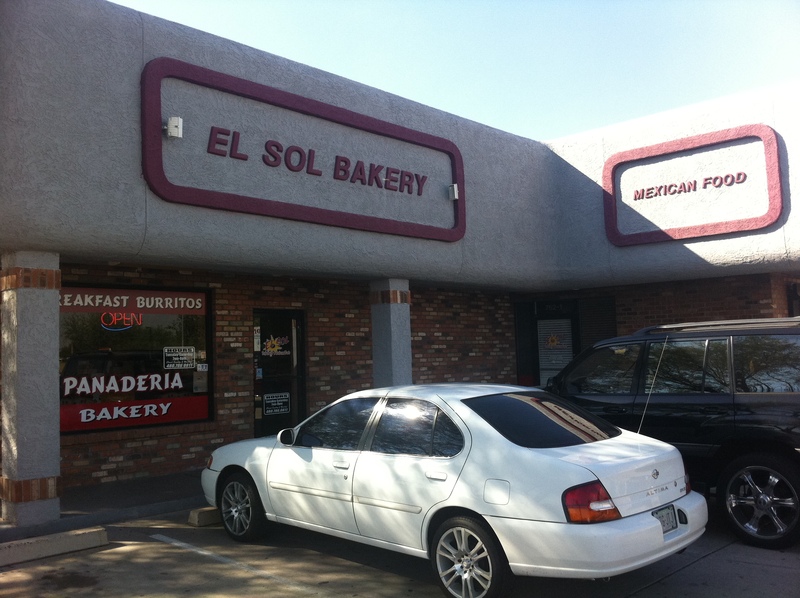 Even with the glare of sunlight on the glass, it's not too hard to see that El Sol is cookin' up the good stuff. Photo taken by Michael West. I walk in through the front door and am instantly drawn to all the treats they have behind the glass in the bakery portion of this fine establishment. There are plenty of enticing options for me to grab, but it’s going to take everything I’ve got in me to resist the temptation of buying one of each of those delicious treats and get them to go. Now, I’ve got to regather and regroup and peep the menu for the Mexican food they offer… considering I am here for some lunch after all. I decide to go with their two taco combo, getting one carne asada taco and one carnitas (pork) taco. The taco combo also comes with rice and beans, but since I’m not the biggest fan of frijoles, I just opt for the double rice instead. The taco combo ran me up to just a bit over eight bucks. I rolled to El Sol with my buddy Brandon as well, and he went ahead and grabbed the taco/enchilada combo. Next, due to the slow Saturday lunchtime rush at El Sol, we get our pick of the table litter as to which one we’re going to sit down in. The dining area inside of El Sol. Picture by Michael West. 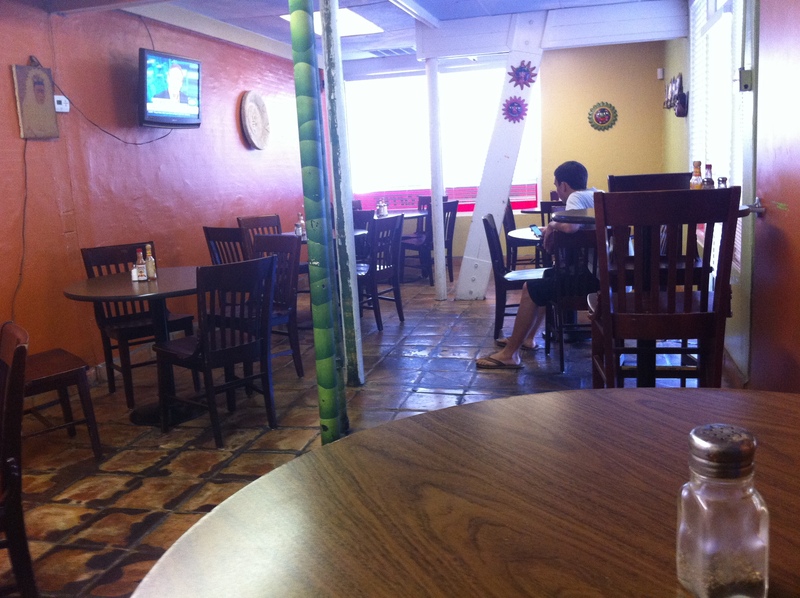 It’s a cozy little eating area inside of El Sol. The walls are painted with colors of authenticity and the walls are sparsely decorated; it’s just an overall good, calming feeling that comes over you once you step into El Sol. I just feel like I’m right at home. Just after we sit down, the man who took our order brings out a complimentary bowl of chips and salsa. If this doesn't get your mouth watering, nothing will. Photo taken by me. The chips are hot and golden; ready for the pickin’. 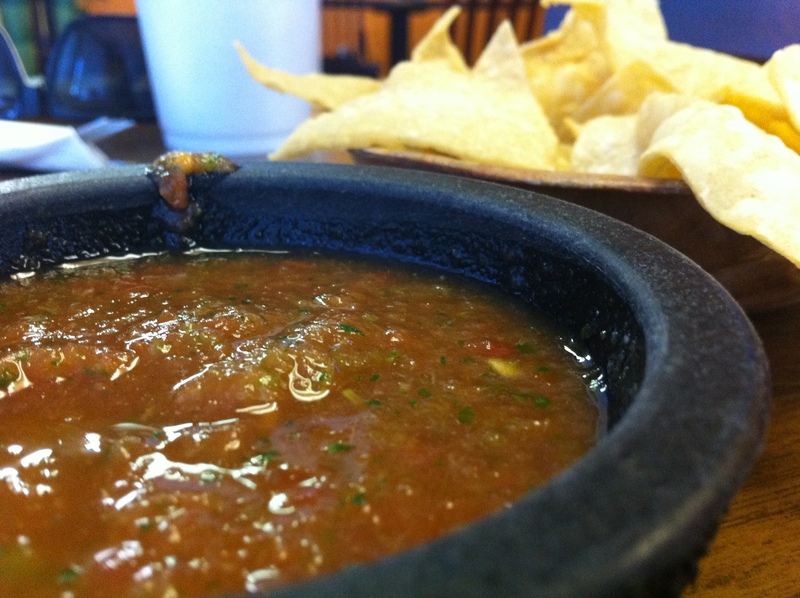 The salsa texture is similar to that of the salsa offered at Chili’s if you ever grubbed on the chips and salsa there. Personally, I love the style of salsa they have. It’s mostly liquid-based, but with tiny microchunks of salsa, if you will. Either way, the combination of delicious salsa and crunchy chips led to an already enjoyable meal, and we haven’t even tapped into the main course yet! We motor quickly through two batches of chips and salsa before our food comes out. Time for the real deal. Oh hello, beautiful. Photo taken by me. One look and I’m in love. These tacos are decently big as well… never a bad thing! Before I notice that they forgot to give me double rice instead of rice and beans, our waiter alerts me that they’ve made a mistake and comes out with a plate of rice 30 seconds later… the friendly service continues to impress me. 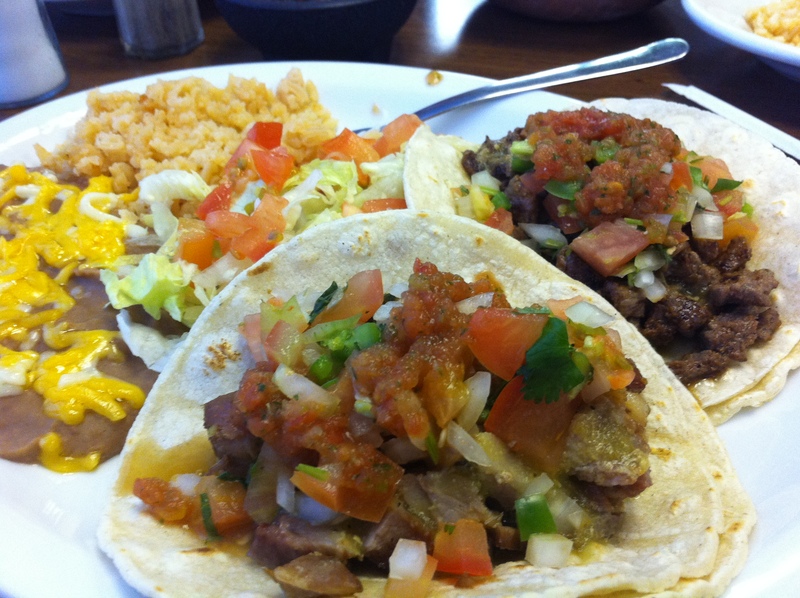 The carne asada taco outweighs the deliciousness of the carnitas taco in my opinion, although both tacos are delicious. There’s plenty of meat in each taco, as well as some tomatoes, onions and cilantro. I loved each bite of the rice as well; there’s no doubt that El Sol’s rice is definitely in the top tier among the rice that the other restaurants had to offer. For Brandon, he said he liked his taco/enchilada combo. 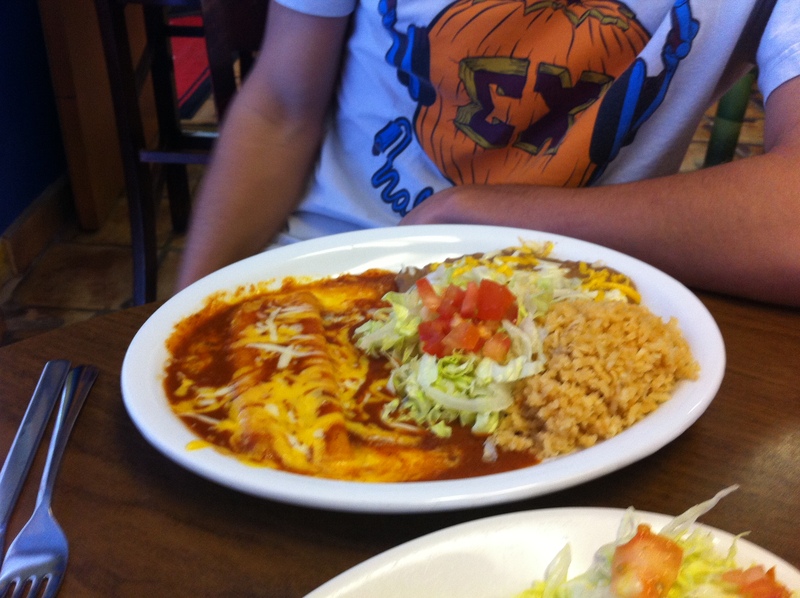 The enchilada plate at El Sol. Photo by me. Moving back to the salsa for a brief moment, I loved it so much that I was wondering if there was any way I could take it home to enjoy for myself. 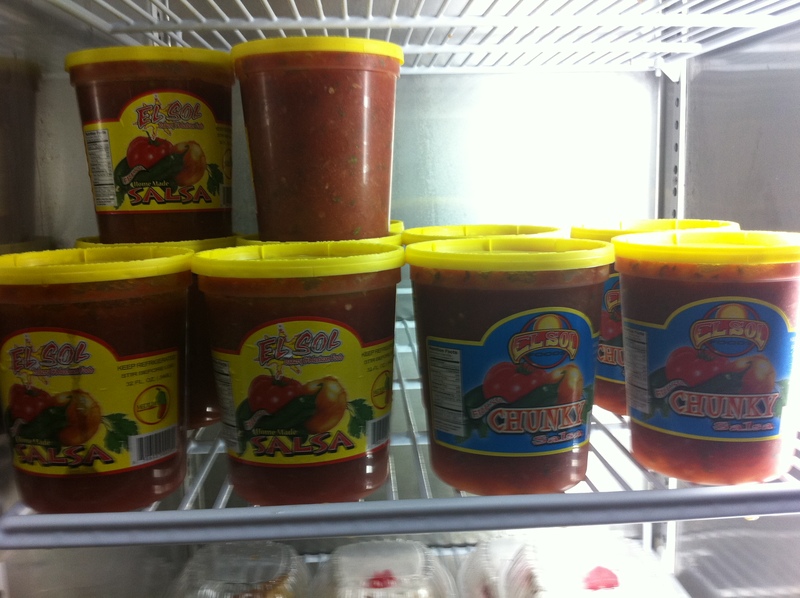 Thankfully enough, they sell little containers full of salsa right in their main area! 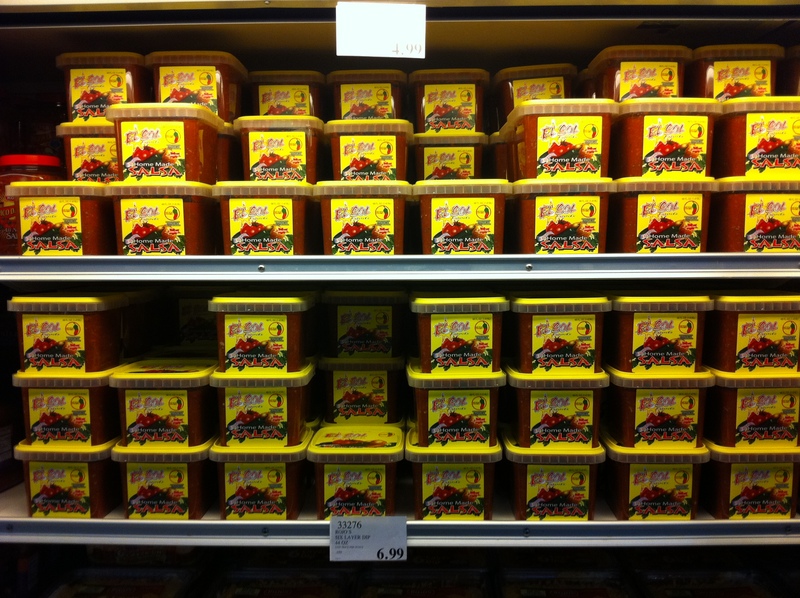 A fridge full of salsa? Sounds like a wish that a genie could grant me. Photo taken by me. Oh my dear sweet baby Jesus... I always knew Costco was heavenly but this is ridiculous. Photo taken by me. So, without much thought, I snag up two of these bad boys and hope to snack on this salsa for days and days to come. Overall, I absolutely loved El Sol. Heck, I’d go back for just the chips and salsa alone! It was a very good meal for a good price, and to top it all off, the service was friendly, quick, and downright quality. 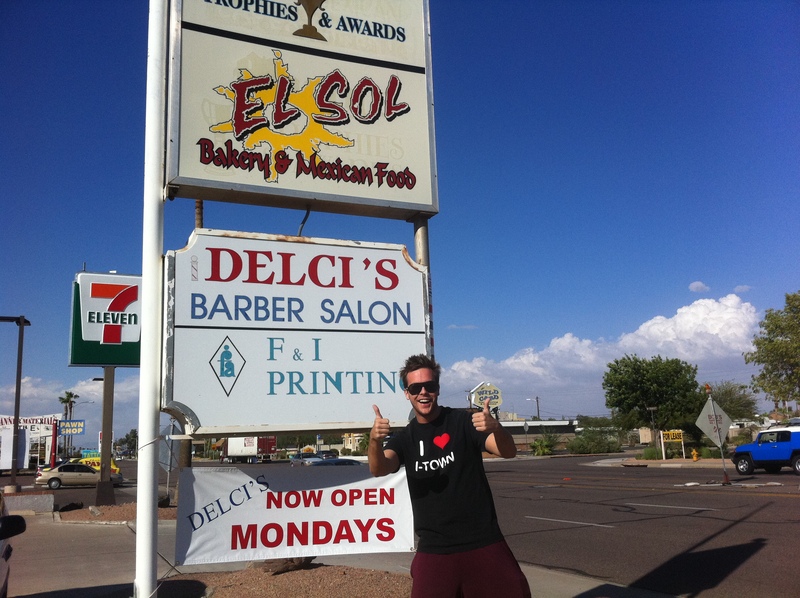 Thanks for a great weekend lunch meal, El Sol, you can count on seeing me again! Two thumbs way up! Photo by Brandon Bickle. Overall: 9.25 out of 10. Open from Tuesday through Saturday, closed Sundays and Mondays.